Ganking in one of the universe’s best free PC games is great fun, but it’s come to overshadow everything else about junglers in League of Legends. 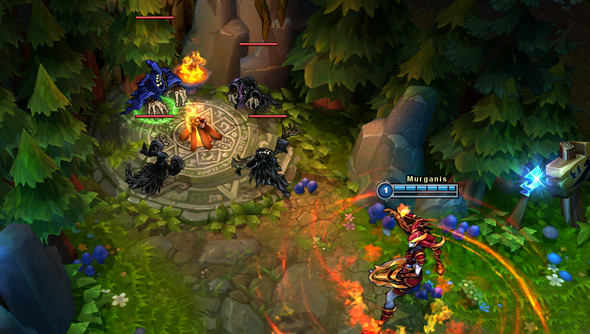 For the 2015 preseason, Riot are looking to improve “strategic diversity” in the jungle. They’d like you to have a wider roster of viable champions to pick from, and more options for customising their items later in the game. As it stands, health-focused junglers are quickly outmatched after their first purchase, and objective-focused junglers are outclassed by gankers who can kill a lane and take the objective with less risk. Heavy-farming junglers have fared just as badly since Feral Flare was nerfed. The first change Riot are testing on the PBE is a new kind of objective for junglers to take and control. Each camp will now offer an extra reward when Smite is used on it. “These mini-objectives should create more variance in jungle routes while also leading to more jungler vs. jungler interaction,” explained Fearless. Further, Riot are planning to step up the “base difficulty” of the jungle by upping the durability and damage of its camps. That’s going to make the jungle a more complex and intimidating place for newcomers, but the devs hope they’ll start to see players relying on a wider array of strengths as a result. Finally, Riot want to overhaul jungle items in the name of supporting different playstyles. The new items will encourage specialisation – offering more power as a ganker, for instance, or more incentive to invade the enemy jungle and steal camps. Is it looking like you’re going to have to make a tradeoff?